On August 31st, 2019 the 6th Night 4F Praski Half Marathon will take place in Warsaw. At 8:30 p.m. a few thousand runners will again set off on a fast and flat route, the leading main arteries of the Praga Południe. Warsaw at sunset, a brisk summer evening, decreasing temperature and fast route is ideal for running! 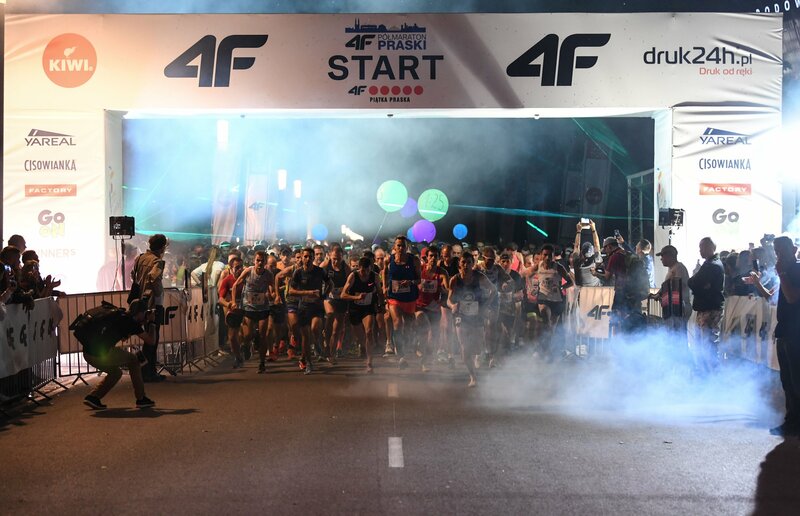 A flat route marked out to promote good results and setting personal best is already the tradition of the Praski event – the biggest night race in Warsaw that has permanently entered the calendar of street runs. The date of the event is not accidental – a half-marathon conducted on an approved route (in the international master class) for many of the participants is a general test before the Warsaw Marathon in September or the Berlin Marathon, and for runners who finished April Orlen Warsaw Marathon a good test at a shorter distance. Again the Praski Half Marathon will be accompanied by 4F Praska Five. Registration for both runs is ongoing. The Praski Half Marathon is held from 2014 (in 2014-2017 as BMW Praski Half Marathon, and from the 2018 edition, the titular sponsor is Polish sports brand 4F).